1. Everyone gets sick – but 1 million Washington workers don’t get a single day of paid sick leave. Paid sick leave allows ill workers to stay home – away from coworkers and customers – without losing pay. But the people who can least afford time off without pay most likely have no sick leave. Many workers who handle food and meet the public – in restaurants, retail, even health care – have no or limited access to paid leave. 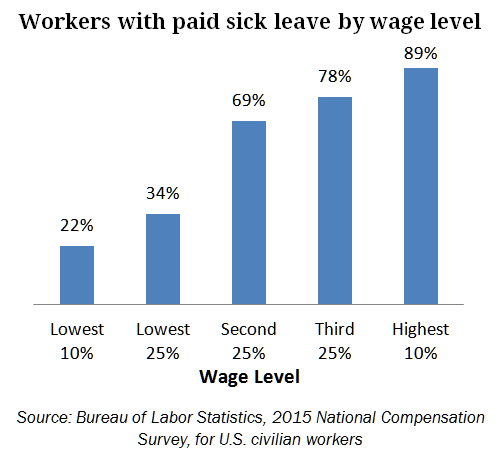 Paid sick leave is associated with more well-child visits, cancer screenings and other preventative health care services – for workers, children, and elderly parents. Sick leave also allows victims of domestic violence or sexual assault to seek safety, treatment, and legal assistance. 2. 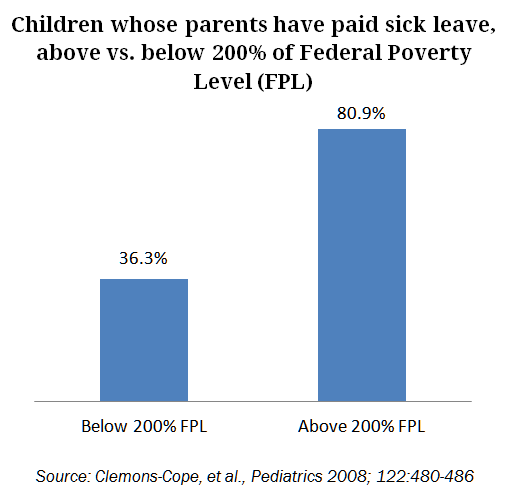 Kids do better when their parents have paid sick leave – and children in low-income families pay the price now without paid sick leave standards. A parent’s lack of sick leave harms the child’s health and ability to succeed at school. Children recover more quickly from illness with a parent present, and taking a child to the doctor is a challenge for parents without sick leave. Over 1 million kids are in Washington public schools – 45% of them in families with incomes low enough to qualify for free or reduced price lunch, which means their parents most likely lack paid sick leave. 441,000 low income kids are in districts outside of Seattle and Tacoma – the only jurisdictions in Washington that guarantee workers sick leave now. Older children are sometimes kept home from school to care for younger siblings when parents are not able to take time off from work, affecting the older child’s educational outcomes, too. 3. Businesses and communities thrive with paid sick leave. Sick workers spread disease to coworkers and customers and are less productive. Employees with paid sick leave have higher morale and are more loyal – decreasing costly turnover and increasing customer satisfaction. The Centers for Disease Control and Prevention found workers without paid sick days are 28% more likely to suffer non-fatal workplace injuries than workers with access to paid sick days. The boost to family economic security provided by paid sick leave makes workers better customers, too. Businesses and communities of all sizes are thriving in the more than 20 cities and 4 states with paid sick leave standards. Washington State Board of Health, Health Impact Review of HB 1356: Establishing Minimum Standards for Sick and Safe Leave From Employment, March 30, 2015, http://sboh.wa.gov/Portals/7/Doc/HealthImpactReviews/HIR-2015-08-HB1356.pdf; Jody Heymann, The Widening Gap: Why America’s Working Families are in Jeopardy – and What Can Be Done About It, Basic Books, 2000, pp. 54-55. Washington Office of the Superintendent of Public Instruction, Demographic Information by District 2014-2015, accessed January 5, 2016, http://reportcard.ospi.k12.wa.us/DataDownload.aspx. Abay Asfaw, Regina Pana-Cryan and Roger Rosa, “Paid Sick Leave and Nonfatal Occupational Injuries,” American Journal of Public Health, Vol. 102, No. 9, September 2012: 59-64. Family Values at Work, Timeline of Paid Sick Days Wins, http://familyvaluesatwork.org/media-center/paid-sick-days-wins.